Darren Long, Sky Sports - reliance on SNG satellite trucks. 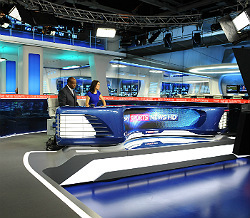 Despite many sports venues in the UK being connected by fibre, Sky Sports still relies on uplink trucks for transmitting video. 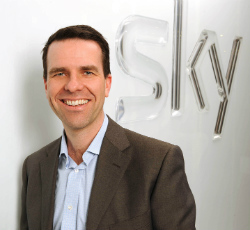 Darren Long, Director of Operations at Sky Sports, said that because of the high cost of installing fibre at venues there is an on-going reduction in provision. “We're a long way off from being able to plug into a domestic broadband connection and be ready to go. Everything needs infrastructure built in and infrastructure is very expensive." The increasing reliance on satellite trucks at sports venues is a boost for the SNG industry which has faced rising competition from mobile IP technologies in the newsgathering world. Darren said: "SNG trucks will not go away because you will always need a truck somewhere where you haven't got a fibre connection. High bandwidth fibre remains the most effective way of delivering content as, although Wi-Fi hot spots do enable connectivity, they do not yet provide the same reliability or speed. The death of the SNG truck isn't upon us yet! If anything, it will just become more efficient at what it does." “With HD becoming more prevalent, we've got to a point where trying to get additional transponder space has become increasingly demanding because more people want more bandwidth. We've had to try to find efficient ways of doing HD transmissions into smaller bandwidth and obviously this is something all content providers are doing."